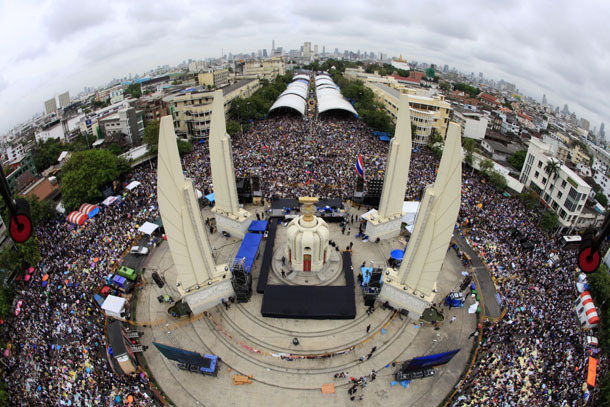 Its the biggest demonstration ever in Bangkok., estimated during its peak early evening Nov 24, at not less than 1.4 million. The strength of the Government lies in its supporting masses, both rural and urban blue collar or similar social strata. However, the class difference is not based so much on the income gap as on the education gap, education not only in the pure academic sense but also including, perhaps more importantly, understanding political issues, political sophistication if you like. 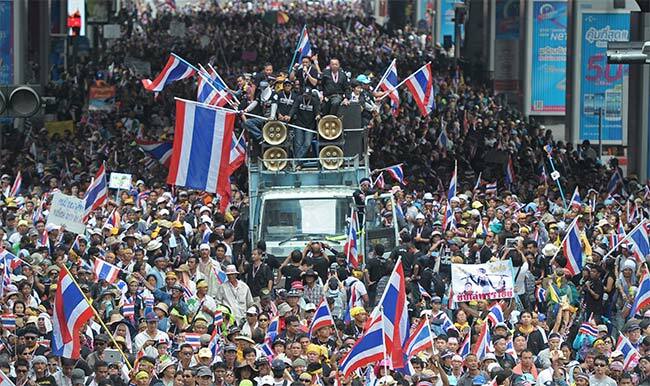 The Thaksin regime has cleverly exploited the gaps in Thai society. It's well organized mass movement, called the Red Shirts after its standard color, has intentionally or not many striking similarities to the pre-World War II Nazi Brown Shirts, providing both the ballot votes and the tool of mob violence when required. These people have been systematically brainwashed by so-called political schools set up by their leaders. The teaching consists of two principal elements,providing both a common bond for members of the movement as well as targets for their struggle. First, the Amart, meaning high bureaucracy or noblemen, actually targeting the monarchy, is presented as the cause of all grievances among the common people, similar to the Nazis accusing the Jews of being the cause of all Germany's troubles. The proselytizing against the monarchy and associated traditional institutions is a major aspect of mass education, exploiting the reality that hate is a powerful weapon and more easily imbued than love or reason, and that most people prefer to blame some one or something else rather than themselves for their shortcomings in life. The second element of Red Shirt indoctrination is to struggle for the common people through democracy, the latter meaning elections, and to protect their government which has a majority in parliament. To the Red Shirts, the Pheu Thai party, representing Thaksin, together with other coalition partners, having a clear cut majority can do anything. Such democratic concepts as check and balances, rule of law, abuse of power, room for the minority to make their case and especially "accountability" are to the Red Shirts simply issues concocted by those opposed to their beloved Thaksin to destroy their democracy. The latest development, coming after the infamous Amnesty Bill, is the attempt to push through a constitutional change to restructure the senate so that it will become totally subservient to the Thaksin regime;this has been condemned by the Constitutional Court as illegal both in spirit and the way it was pushed through parliament. The Government's reply, through its MPs, is simply to say that it does not recognize the authority of the Constitutional Court and will take measures to dissolve the court. (The Thai Constitutional Court is modeled after the German counterpart with the specific aim of providing checks and balances, and specifically to ensure protection against parliamentary dictatorship). Thus the haves and have-nots dividing Thai society at present is based mainly on knowledge and interpretation of democracy, and the larger issues facing the country such as the rice support scheme which is rapidly pushing the country towards bankruptcy, or the bill authorizing the Government to take out a foreign loan of 2.2 trillion Baht in a lump sum for various dream transportation schemes; the main objection centers on the fact that the government's bill will not put the money into the country's coffers, i.e. The Finance Ministry, and its spending will be outside the annual Budget Bill and will not go through any parliamentary process or supervision. Additionally, the bill is written in such a way that the stated intended projects can be changed to whatever. Never have I seen a scheme so blatantly aimed at massive corruption. Would a similar bill be possible in the US, with no congressional involvement except at its inception? Here, the Bill was unstoppable because of the Governments parliamentary majority. Oh, there is another difference leading to the differing attitudes between Thaksin's rural supporters and the urban crowd. The former do not pay any personal income tax but love Thaksin for showering them with various benefits from his populist schemes while most of the urban educated class resent this because it is the taxes from their hard earned wages which are paying for this. That is a short summary of the situation as of this moment. Today one column of the demonstrators have taken up residence in the finance ministry and Budget Bureau where they arrived this morning to open gates and welcome by the officials there. Meanwhile, the government is also massing its Red Shirt supporters in a sports stadium for possible confrontation, with fiery proselytizing going on, reminding me of the violence and political sophistication of Mao's erstwhile Red Guards. A potentially disturbing report this evening, Nov 25, is that the Bangkok City Administration has protested that its cctv cameras on areas under the Police commando / riot control units are being covered up. This may signal the Government's intention to resort to violence to challenge and end the demonstrations. Leading personalities in the government camp have on occasion implied a belief that educated demonstrators may be good at righteous rhetoric but would be no match for their Red Shirt hoodlums, especially if the latter are backed by Police Riot Squads and the mysterious men in black.